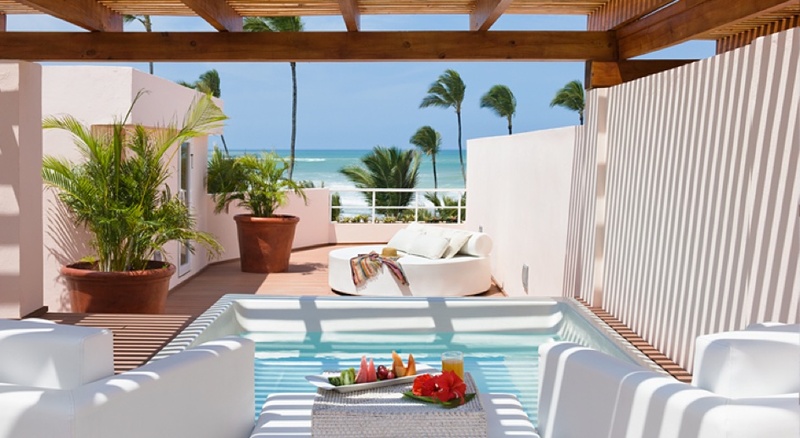 Excellence Punta Cana is a stunning all-inclusive Honeymoon Resort located in the Dominican Republic. It is one of the best value all-inclusive locations in the islands. Excellence Punta Cana offers an adult-only atmosphere. The colonial-style property features a variety of guest suites as well as 2 pools, a swim up bar, 2 outdoor jacuzzi’s, 9 international restaurants and 10 bars — and this is just the beginning. It dominates a lengthy stretch of secluded white sand beach on the northeast coast of the Dominican Republic. Mingling with tropical palm groves, white sand beaches, and numerous recreational options, the resort boasts nine restaurants and ten bars, including a beach bar and a swim-up bar, featuring a wide range of cuisines and 24-hour room service. Guests can enjoy 2 large outdoor pools with poolside and beach service available. and outdoor seating areas mean plenty of room to spread out and unwind. Club suites feature sea views, some with their own roof deck pool and all with the services of a personalized concierge ready to attend to your every need. Additional perks include a mini bar with premium spirits, stocked to taste, and upgraded room amenities such as premium in-room liquor and wine preference. well-equipped fitness center plus facilities for tennis, squash, basketball, racquetball, bocce ball, volleyball, table tennis, billiards, darts, horseshoes, lawn chess, croquet, shuffleboard, and archery. Equipment for snorkeling, sailing, windsurfing, canoeing, and kayaking is available, and scuba lessons are offered in the hotel’s pool. Nature enthusiasts may arrange bird watching excursions on the River Nisibon, or enjoy moonlit horseback rides along the beach. The full-service MIILE SPA health club features 14 indoor treatment rooms, 1 couples spa treatment suite and 6 couples treatment rooms, a Vichy shower room, Brides room, and 1 couples outdoor treatment room with spectacular views, surcharges apply. Services provided at this boutique facility include body and facial treatments, aromatherapy, hydrotherapy, manicures and pedicures, and couples treatments. Advanced reservations are required for massage and spa treatments. Excellence Punta Cana is an adult-only resort. Excellence Punta Cana is an excellent location for those seeking the perfect destination wedding. It pairs luxury with value for those seeking to invite guests to the celebration. Remarkable Honeymoons will assist the bridal couple and their guests every step of the way. A Remarkable Honeymoons Package to Excellence Punta Cana will include nearly all aspects of your trip to the Dominican Republic. We will arrange airport transfers from shared to private, we will assist with any and all reservations according to your needs. Contact Remarkable Honeymoons for current rates and specials!